The World Bank Group (WBG) has committed $1 billion for a first-of-its kind program to accelerate investments in battery storage for electric power systems in low and middle-income countries. This investment is intended to increase developing countries’ use of wind and solar power, and improve grid reliability, stability and power quality, while reducing carbon emissions. The WBG financing is expected to mobilize another $4 billion in concessional climate financing and public and private investments. The program aims to finance 17.5 gigawatt hours (GWh) of battery storage by 2025 – more than triple the 4-5 GWh currently installed in all developing countries. The program was developed by the Energy Sector Management Assistance Program (ESMAP) and Energy Climate Finance teams, which continues to lead its implementation working with World Bank regional energy units and the International Finance Corporation (IFC). The transition to renewable energy sources in today’s power systems is becoming one of the largest contributions in tackling climate change. The significant increase in the deployment of wind and solar power and other forms of clean energy, however, requires different forms of flexibility to manage the intermittency of these sources. Due to its fast response, ease of deployment and current trends in cost reductions, battery storage is becoming a significant solution to provide this flexibility. Storage takes many forms – pumped storage, compressed air storage, and thermal storage, among others. The WBG has been supporting pumped storage and thermal storage (in concentrated solar plants) for years. But batteries – while showing great potential – are still expensive, with a small market primarily in developed countries. Where they are needed most is in developing countries, where power grids are weak and cannot take full advantage of their solar and wind potential, or in emerging economies with a rapid increase in energy needs especially during peak hours. The current mainstream market for batteries is driven by the electric vehicles industry. Batteries are developed for vehicle application needs and have inherent limitations (e.g. size and weight are limiting factors for vehicles). The existing batteries are not optimized for use in power systems. Most cannot provide long duration storage and many cannot withstand harsh climatic conditions and low operation and maintenance standards. There is a clear need to catalyze a new market for batteries that are suitable for electricity grids through a variety of applications (not just for electric vehicles) and deployable on a large scale in developing countries. 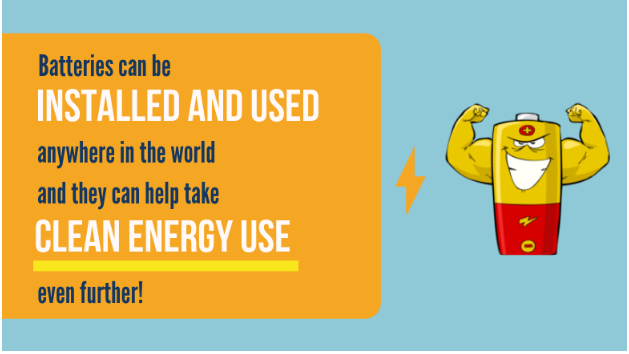 Learn about our global think tank initiative by writing to energystorage@worldbankgroup.org. The WBG is launching a global think tank – a partnership between labs, research institutions, storage producers, project developers, policy makers and regulators, development partners and philanthropies – to foster international cooperation that can help develop and adapt new storage solutions tailored to the needs of developing countries. Universities, research institutions and development partners (policy makers, regulators, and donors), as well as industry associations, are invited to participate in the global think tank. The think tank will take a holistic technology-neutral approach to energy storage, potentially covering all forms of energy storage technologies.